Alhambra, CA - On Sunday, September 1st, 2013, the third day of the Jubliee Celebration of the Western American Diocese, the Hierarchical Divine Liturgy was concelebrated by His Grace, Bishop Maxim of the Western American Diocese, His Eminence, Archbishop Joseph, Antiochian Bishop of Los Angeles and the West, and His Eminence Archbishop Benjamin, OCA Bishop of the West, together with all the Clergy and faithful Orthodox Christians from throughout the Western American Diocese. This was a beautiful service of thanksgiving, with prayful responses from the Saint Steven's Cathedral Choir who were joined by many singers from parishes throughout the Diocese. 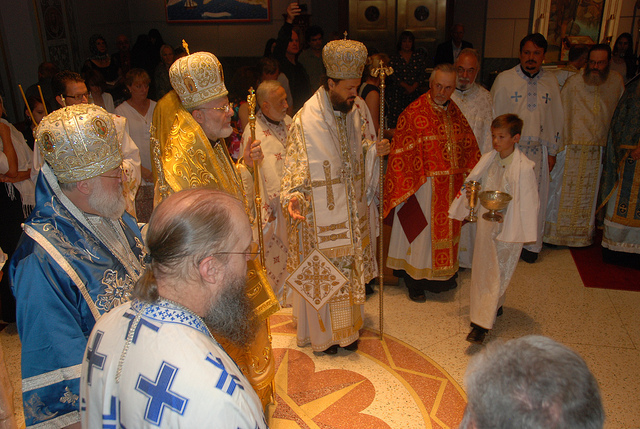 When the Divine Liturgy came to an end, the Hierarchs and Guest Speakers made their way to the Diocesan Office where a beautiful reception awaited them. During this time the parishioners and visitng faithful made their way to the main hall where the Grand Banquet and Program was to begin not long after. As guests enjoyed the hor d'oeuvres, and fellowship with family and friends, they made their way to their seats where a special gift awaited them. His Grace, Bishop Maxim had prepared for this event, a very special edition of the "Annual," which this year was adorned with beautiful photos and artcles about the history of our Western American Diocese and every parish, mission, monastery, and skete in the Diocese. It is truly a treasure that every family will want to have in their homes. Once everyone was seated, our emcee, Ben Lemon, introduced the Hierarchs and Guests one by one as they entered the hall. The Banquet began with the Lord's Prayer and the delicious meal prepared by the hands of the ladies of the Saint Steven's Women's Auxiliary was served. While everyone enjoyed their meal the program began with songs sung by a young and very talented group of singers, "Breze," from the St. Sava Church in Phoenix. This was followed by the reading of the Epistle to Diognetus which was read beautifully by Zeljka Gortinski and Ben Lemon. We were honored then to hear a few words from His Eminence, Archbishop Joseph and His Eminence, Archbishop Benjamin, followed by the Keynote Address given by our guest speaker Rev. Hieromonk Iavokos from Simonopetra Monastery on Mount Athos. His Grace, Bishop Maxim then presented special gifts of gratitude to His Eminence, Archishop Joseph, His Eminence, Archbishop Benjamin, and honored guest speakers Rev. Hieromonk Iakovos, V. Rev. Dr. John Erickson, and Dr. James Skedros. The Grand Banquet and Program then came to an end with the singing of Dostonojest! After a few more hours of fellowship and dancing, the final event of the three-day Jubilee Celebration began. Many stayed for a special Wine Tasting Dinner! As guests enjoyed a delicious meal preapred by the parishioners of Christ the Saviour Church, they were given the opportunity to experience the qualities of several different types of wine from Monastery Tvrdos. That concluded the festivities of the Jubilee Celebration of the Western American Diocese at Diocesan Days 2013. It was truly an magnificant and historic event enjoyed by all who attended and participated in it!